A few weeks ago my husband and I took our boys to visit the Library of Congress. While we were there I was awe struck admiring the Gutenberg Bible they had on display. The fragile pages were filled with the most beautiful script-each letter as perfect as the others. It reminded me of growing up how I admired my mother’s neat handwriting and would spend hours trying to emulate it. When we started homeschooling last year I knew writing was going to be one of our biggest challenges-not only for the actual mechanics of handwriting (my 7 & 8 year old boys have awful fine motor skills!) but also for the actual writing and communicating process. While my handwriting is neat and practiced, theirs LITERALLY looks like chicken scratch! My boys would tell me the most fantastic stories or spout off facts about LEGO or animals for hours but if I ask them to write it down for me they shut down. It may not seem like it but the act of playing with modeling clay helps build strength in the hands that helps with fine motor skills and endurance needed for writing. Plus it’s fun! I have my boys write on a white board or chalkboard on the wall regularly. The larger area and vertical orientation help with proper wrist extension and shoulder stability needed for writing. My 7 year old has always had a funky pencil grip and it took quite a few tries to figure out the right pencil grip that would work for him. Once we found it through a lot of trial and error (good thing they’re cheap!) his grasp improved rapidly. For my three year old we’re starting early by using grips from the get-go. I also give him pieces of chalk about 1″ long to draw on our chalkboards, the tiny piece forces the correct grip position! When writing on paper, the paper should be slanted at a 45 degree angle and the non-dominant hand should stabilize the paper at all times. This was a HARD one for my boys to get so we made it easy with some fun washi tape guides on their desk to remind them! We write every day-it’s a requirement before even their morning cartoons, and yes even on the weekend! 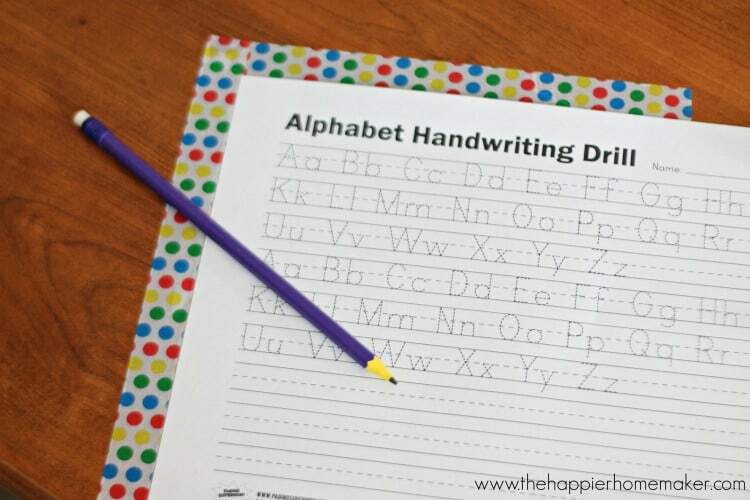 We warm up with a simple alphabet tracing sheet so that they can get the right letter formation first thing before any other work. After that one worksheet I try to keep writing fun-when birthdays are approaching asking for a birthday list gets them writing very easily! Letters to family members are also fun because they love getting mail in return. We recently spent two days writing and revising letters to LEGO with ideas for new sets we thought they should build and sell (and they wrote us back and even sent a package with surprises!!) We’re working on writing to the President right now! 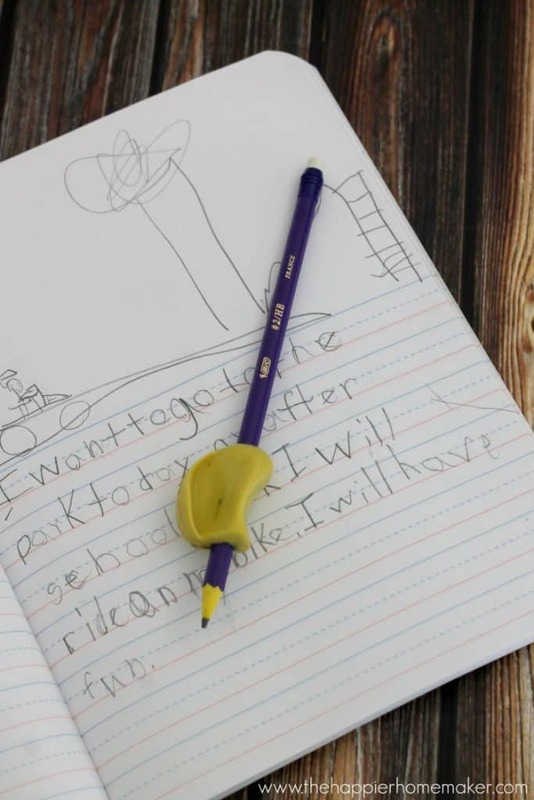 Writing instruction is recommended for students for at least 15 minutes a day to improve motor skills, cognitive skills, and reading and comprehension. Experts have shown that writing instruction can improve process like ideation, text production, punctuation, planning, spelling, & grammar. 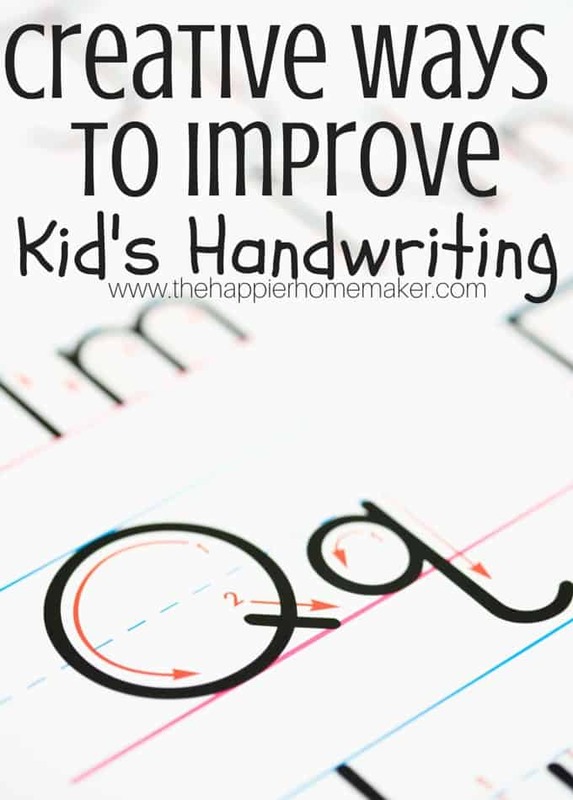 Better handwriting correlates with better performance in both reading and writing. So do you have any kids in your life who struggle with writing?